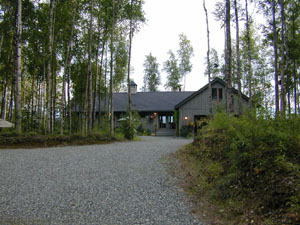 Wasilla, a small town about 50 miles north of Anchorage is where our friends, the Abshires, live in a beautiful home overlooking a nature preserve marsh land. Actually the marsh was formed when the earth sunk about 25 feet during the great Alaskan earthquake of 85. Kriss designed the house and the contents and her artistic talents really shows. 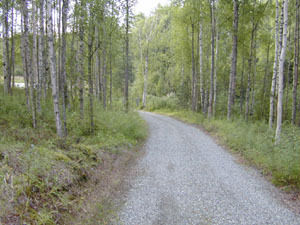 As with most drives in Alaska, the drive into Kriss and John's home is gravel. This, we were told, is because of the hard Alaskan winters. Just over the rise, the house comes into view. The front is great but wait till you see the back view. 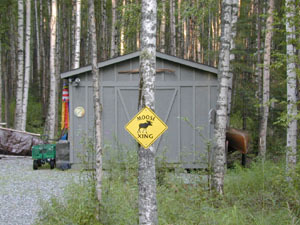 We were constantly aware of the Alaskan wild life but this was a bit too much. 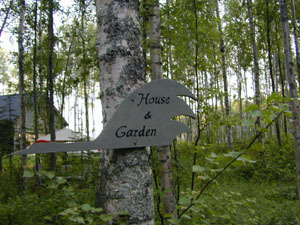 The aspen trees and the signs along the path welcomed us to the warm glow of the Alaskan hospitality.